We take great pride in the quality of our products. If for any reason you are not satisfied with your order, please contact us immediately. We do not accept returns or offer refunds on personalized items. If, within 30 days, you are dissatisfied, you may return any non-personalized item(s) in the same condition as they were sent to you for a refund or exchange. Damaged, abused or heavily used items will not accepted. Returns for reasons other than a Mason Row error, is subject to a 50% return fee. We reserve the right t issue a store credit (rather than a refund) for merchandise returned more than 60 days after it was ordered. Shipping charges for the original order will be refunded if the entire order is returned, or if the return is nesessart due to a Mason Row error. We are able to issue refunds for return shipping charges. Please allow one to two weeks once we receive your return for your refund to be processed. 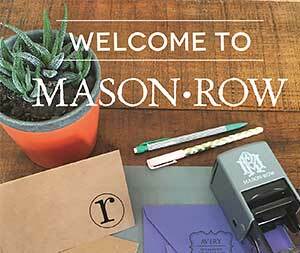 Returns due to a Mason Row error made within 31-90 days of the original purchase will be refunded as a mason Row Gift Card at the original price paid. No refunds, for any reason, accepted after 90 days of original purchase. If you have a specific question, feel free to get in touch with us directly.